Enjoy $15 off orders $199 or more with coupon code CTMSAS15 (excluding clearance items). Expires 12/31/2017. Enjoy $35 off orders $399 or more with coupon code CTM35OFF (excluding clearance items). Expires 12/31/2017. Enjoy $45 off orders $599 or more with coupon code CTMOFF45 (excluding clearance items). Expires 12/31/2017. Enjoy $55 Off your $699 or more with coupon code CTM55OFF (excluding clearance items). Expires 12/31/2017. Artificial Christmas trees are a sound investment because you can use them every year as long as you can keep them in good condition throughout the year. The Christmas Tree Market is your choice destination if you're looking to buy an artificial Christmas tree, whether you're looking for a tree less than six feet or one more than nine feet. You can also shop by price, and can get a really good deal on your tree buy utilizing Christmas Tree Market coupons to your advantage. 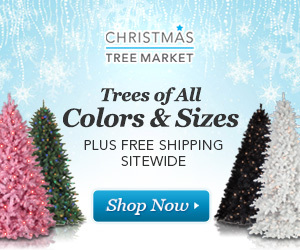 Found a coupon for Christmas Tree Market?